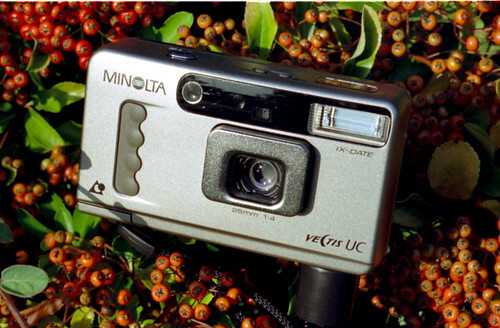 The Minolta Vectis UC is a compact camera of Minolta's Vectis series for the Advanced Photo System. With its 25mm lens it can be called a wide angle camera. It was manufactured in Indonesia. Its body's design seems to be derived from a simple piece of curd soap. Its oblong lens barrel is shifted out of the body when the camera is switched on. A two-part sliding door covers its lens when it's switched off. It stores PQI infos for each exposure, on the magnetic surface coating of the APS film. It can also store the date and time of each exposure. Different flash modes can be chosen for the built-in electronic flash, as well as a self-timer mode for the next exposure. All these settings can be controlled by means of a small LCD display and two little push-buttons on the top. The on/off button is below the finder ocular, the format switch beside it. Shutter: electronically controlled shutter with speeds 1/4 to 1/350 sec.